Recorded and released in 1960, His Hand in Mine is the first of three gospel albums that Elvis Presley recorded during his lifetime. From rock & roll firebrand to pop crooner to gospel believer, Elvis' career went in many directions that his earliest critics could hardly have believed. Was it heresy or conversion or commercialism that had caused Elvis the Pelvis to record a gospel EP in 1957, and then a full LP in 1960, just months after he returned from his Army stint? The answer was, of course, none of the above. What the critics didn't understand was that Elvis wasn't just a cultural phenomenon but a cultural chameleon, a vocalist who took in a range of influences – from Big Mama Thornton to Dean Martin to the Statesmen – without ever considering the possibility of a contradiction. The same teenager who couldn't stop listening to black R&B was also in attendance at each one of the monthly gospel singing meetings held in Memphis during the early '50s – and the teenage Presley was well-known to Jake Hess and the Statesmen for his exuberance and innumerable questions about the technical side of gospel quartet singing. 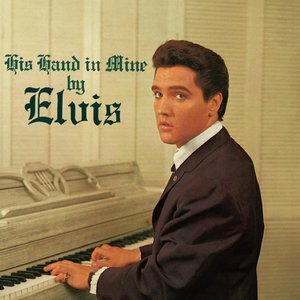 Several years after his first rock success, during a single late-night-and-early-morning session in October, 1960, Presley recorded the material for his first full gospel LP, His Hand in Mine. Combining the spiritual force and the physical release he'd experienced from the best gospel singing, Elvis revealed himself as an all-time-great gospel singer, someone who had energy to spare (hardly a surprise) but also immense reserves of control and precision (a rarer commodity among rock & roll singers). Most of the songs were standards from the Statesmen, Blackwood Brothers, and other classic quartets Elvis loved, and represent some of the best ballad singing of his career – after all, it was recorded at the peak of his balladic powers, a time when "It's Now or Never" and "Fame and Fortune" had not yet given way to "Can't Help Falling in Love." He's fantastic serving as the lead voice in a group vocal – years of advice from the best had paid off – and he shows off his excellent high-tenor singing in a range of situations (tender on "Known Only to Him," playful on "I Believe in the Man in the Sky"). His Hand in Mine isn't just one of Elvis' best LPs, it's one of the best (and best-recorded) gospel sessions of all time.